Whether for recreation or sport (or for dinner), fishing is a fun pastime. But you have to choose the right equipment as well. A lot of what equipment you buy depends on where you want to fish, and what you expect to catch. You'll have to choose the right type of rod, line, and reel. 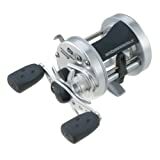 Of the types of reels available, the baitcasting reel (or revolving-spool reel) is one of the most established types of reels. It is the best for catching large fish, that require live bait or lures. They have a number of mechanisms that keep the fish from getting away, once it has hooked onto the bait or lure. Here is a guide to some of the best baitcast reels on the market. 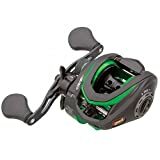 The baitcast reel has the spool of line mounted above the fishing rod. The reel can be either right- or left-handed. You attach the lure or bait to the hook, cast the fishing rod with your strong hand, and then transfer the rod to your weak hand, and reel in the line with your strong hand. 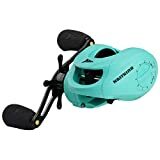 (This is distinct from the spinning reel, where the reel is underneath the fishing rod, and the same hand can be used for casting the line out and reeling it back in. 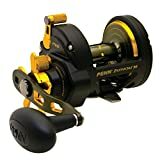 But spinning reels have the problem of the line detaching or getting trapped on the spool. There is also the risk of the line getting twisted if the lure gets spun around. Fishermen prefer baitcast reels for fishing in deep water, casting long distances, or where fish put up a fight and try to escape. Round: The round baitcast reel holds more line, and is used for heavier line. It is used for larger, heavier types of bait. Low-Profile: This type allows you to do palming (putting your palm on the revolving spool, to stop it from spinning if you see that the fish is trying to escape with your bait or lure). It is considered more ergonomic than the round reel. Reel settings: There are methods of adjusting the brakes on the reel, as we mention below. Sometimes the fish doesn't give up so easily, and you'll need some persistence to reel it in. That's where the reel settings come in handy, to tire the fish out until you manage with it. 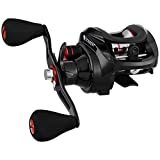 Variety of reels: Since the gear ratio that you need can vary, some recommend getting all reels with all three types of gear ratios: slow, medium, and fast. Material strength and weight: Most baitcast reels come with an aluminum spool, but more expensive models are from forged aluminum, which are more rigid and sturdy. Some reels also have holes drilled in them, to reduce their weight. That's a consideration when you have to hold the rod for a long time. Spool tension knob: This helps you adjust the spool so that as soon as your lure or bait touches the water, the spool will stop revolving. That will avoid letting out too much line. Centrifugal brakes: These work on friction to stop the spin of the spool. This also helps to keep the line taut. Magnetic brakes: These use adjustable magnets to slow the spool's spinning rate. 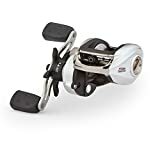 Clicking mechanism: Baitcast reels have a clicking pawl-ratchet mechanism—the pawl is a piece of metal added to the spool that clicks into the teeth of a toothed wheel gear. It keeps the spool from going in the opposite direction. When the spool clicks, that indicates that the fish has taken the bait. So you can put the rod down, until you hear a clicking sound, which indicates that the fish has taken your bait. Then you can start reeling it in. Gear Ratio: The gear ratio tells you how many turns the spool of line makes for each turn of the reel handle. Usually baitcast reels have a ratio of 6.4:1—when you turn the reel handle to bring the line back in, the spool turns 6.4 turns. 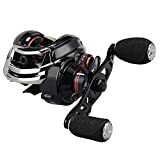 The right gear ratio for you depends on your type of lure: if you are using spinnerbait or buzzbait (a type of lure that has blades that either spin or stir the water), then you'll want a high gear ratio, to use the illusion that lures the fish. But for crankbait, which is a lure in the shape of a fish, you'll want a slow gear ratio, that gives the impression of a slow-swimming fish. Also, if you cast only a short distance, then you would want to get a high gear ratio, to get the lure/bait back for another cast. Shimano— is a company specializing in outdoors equipment, that was established in 1921, based in Osaka, Japan. They make bicycle components, fishing supplies, and rowing equipment. 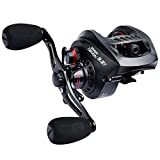 Daiwa-- is a Japanese company founded in 1955 that manufactures fishing gear. They run their American sales and distribution from Cypress, California. They employ many innovations in their fishing gear, to make them durable against saltwater and rust. Pfleuger Fishing— is a renowned and established company, founded in 1881 by Ernest F. Pfleuger in Akron, Ohio. They started making fish hooks, but then expanded to fishing tackle and gear: rods, reels, sinkers, floats, lines, baits, lures and more. They introduced their own model of fishing reel in 1954, and now offer baitcasting, spinning, trolling and fly wheels. 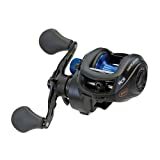 Okuma Fishing Tackle is a Taiwanese manufacturer of fishing tackle. 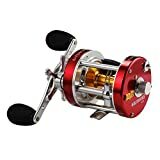 They manufacture all the major types of reels: spinning, baitcast, float, star drag, fly, and more. They also sell fishing rods, fishing apparel and other accessories.